The second way - is to read the ads hanging around the Imperial City, about what is wanted by Gray Fox - the mythical leader of the Thieves Guild. After that, in the dialogues will be a new topic - "Grey Fox". About it you need to ask at the poor, after raising their attitude toward themselves, otherwise they will say that this is just a legend. At sufficiently good frame any of the poor say that if you want to get more information about the Gray Fox, you need to go at midnight Darelota Gardens. In a different way - in any way. So at midnight in the gardens Darelota gathered a small company. 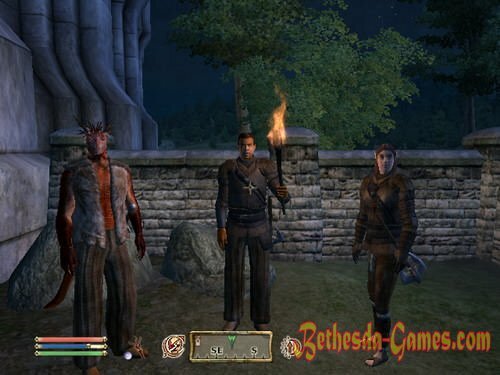 Armand Christophe (the man with the torch) - Representative of the Thieves Guild, and the other two members and Argonian Amuso bosmerka Metredel - it is the candidates for accession, just like you. Armand Christophe is not against the entry of new members, but it needs to prove that you deserve it is the membership in the Thieves Guild. For this, he gives the task: to steal Amantiusa Allektusa blog. Who was the first of his will, and he will deserve membership in the Thieves Guild. Others - alas. Amantius Allektus lives somewhere in the city. Exactly where he advises to ask at the poor. He also says that during the job no one should suffer. Kill during the execution of the job is strictly prohibited. So, you can go and ask about the poor house Amantiusa (if you're lucky, you can get there before Metredel), but Metredel already knows where the house and immediately hurry to get there first, so you can just follow her to the house Allektusa. Once you get inside, you need to find a diary. The problem is that Metredel will not just stand around, and will try to get it first. Diary is close to the desk Amantiusa, pick it and go back to Armand Christophe. If Metredel reached him before, then you can try to steal the diary from her pocket. But if you missed it in mind, we have to ask the beggars on where it lives. If you do not Metredel to rival, and she managed to deliver the first Armando blog, then you Amuzeya and there is a second chance. More precisely, only for you, because Armand said Amuzeya bungler and not give him the job. You need to get to Rohsann and steal her sword. Where does Rohsann, prompt all the same poor. Rohsann keeps a shop called "slim chance" in the shopping district. Our way to her at night, steal the sword out of her room and go back to Armand Christophe. Once you join the Thieves' Guild, you need to take an oath Gray Fox. Now you can use the services of a fence - Ongar living in Broome. Also, Armand just half the price can shoot bounty on your head. After the failure of Amuso decides to become an independent thief, but that his story does not end there. Interesting to read blog entries about classes Allektusa. More precisely, that he grows. So now you are a member of the Thieves Guild and you can use the services fence. Incidentally, they are not so much privilege as necessary, because no stolen items to the required amount, you will not be able to move further up the career ladder and perform tasks. On you and the thief. 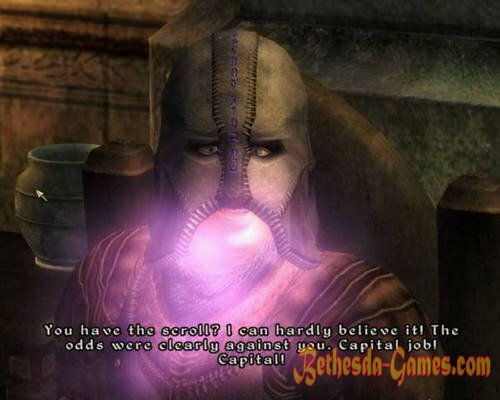 But if to perform the first task is simple enough to sell the stolen items in the amount of 50 Septims, the last to perform need to have stolen good price is not less than 1000 gold. Therefore, in order not to suffer in order to run between jobs clean out the house, it is better to have stolen the sum of 1000 gold. The best place to steal - a shop in the shopping district of the Imperial City. Need to sell stolen goods buyers-up for 50 Septims to get this job. Armand Christophe gives the first task. Poor people living in Waterfront, Hieronymus Lex recently taxed. Although by law, all imperial residents must pay taxes for 53 years no one collected them from poverty-stricken population Waterfront who barely make ends meet. Since the Gray Fox is the protector of the poor, it is necessary to get to Hieronymus Lex and steal already collected taxes and tax records. Where the office of Hieronymus Lex, ask the poor, and said goodbye to 10 gold, we learn that it is in the South Tower. It is best to go for the work at night, when Lex will sleep. The lower floors of the South Tower open to the public, although the guards stationed there, will refer to the latter-day guest with a grain of salt. Lex office will be closed, will have to break it. Take the Money and statement and return to Armando. That will take a statement, and the money will leave you, as a reward. Gray Fox will return the taxes collected from the treasury of the guild. After performing this task Armand will increase. Now you - Rogue. Need to sell stolen goods buyers-up $ 100 Septims to get this job. The following task from Armand Christophe is that we should steal bust Llatasy Indaris of Cheydinhal. But for this you first need to figure out where this is bust. Go to Cheydinhal and asked about the bust beggars. Goodbye to 15 Septimius, we learn that Count Indaris recently commissioned a bust Llatasy and now placed him in the basement of the chapel, next to her tomb, guarded by guards. Our way into the chapel and quietly break open the lock. Then sneak past the guards, stole the bust and go from the basement. Now with prey return to the Waterfront ... and notice that for our arrival he occupied the imperial guards, led by Hieronymus Lex, who ordered the arrest of Armand Christophe for theft bust Indarisa. Armand of nowhere. Waterfront questioning residents about where Armand Christophe, we learn that he was in hiding, but we are urgently looking for Metredel. We can only wait in the area of ​​the Imperial City, and Metredel soon come upon us. She tells us that no customer's bust was not. It was rigged operation in order to identify the informant Lex inside the Thieves Guild. They turned out to be a dark elf named Mivrina Arano. However Metredel have a plan to get rid of Mivriny Arano and Lex. For this we need to convince the latter that Mivrina Arano is a thief. To do this, you need to sneak into the house and put a bust Mivriny Indarisa her cupboard. Better to do it at night when danmerka will sleep about anything without knowing it. After the bust will put some refreshment, must be reported to Lex, hanging out on the street nearby, where there is a bust Indarisa. But to Lex and believe it to be the location you were at least 70. Only then did he go check buffet Mivriny, saying that it was his duty, though he doubted your words. Doubt it will be a short time - just as long as their own will not see the bust Indarisa in the cupboard of his informant. Following the discovery of the statue he Mivrinu arrest and bring his people out of Waterfront. Now we just have to wait until midnight to meet with Armand gardens Darelota. He apologized for what had to use you in this adventure: he was not sure that you are not an informant. Anyway, he will pay 100 gold for the case and erect a new rank Bandit, which will allow you to access the fence of Leyaviina. Armand can be found on their own, but he refuses to talk to you, as it will be on the run. Need to sell stolen goods buyers-worth 200 Septims to get this job. Armand Christophe no more jobs for you. Now your boss is S'Krivva from Bravo. Find S'Krivvu possible or in her home, or at the inn "Lonely petitioner." We have S'Krivvy job for us: it is necessary to return the family ring belonging Ahdarzhi. This hadzhitka lives in Leyaviine. Go there and find out for 5 coins in the poor, where she spends her time. We become aware that the day hadzhitka loves to dine in "Three Claws", and in the evening spends his time in the tavern "Three Sisters." Hadzhitka unhappy with the loss of the ring, she will say that it stole our old friend - Argonian Amuso. It is so evil that it craves death, despite the fact that it is contrary to the rules of the guild. So, we need to know where is hiding Amuso, so you need to again use the services of the poor informants. And if their ratio is less than 70, you have to say goodbye to 10 coins, then they will be told that Amuzeya arrested. Now he is in the dungeon of the castle, but the jailers are easily bribed, and they are willing to let visitors to prisoners. So, go to jail. At the entrance to the guard on duty, but it is safe to get around, crept through the storage room. However, it will be enough just to pay 20 Septims guard, and he will allow us to see Argonian. So, in prison for one of the lattices sits Amuso. He, however, did not give a ring for nothing, but only if we can help to make his escape. To do this, we need to give him one of his master keys. In gratitude Argonian say that the ring had gone, he tried to sell his most Countess - Alessia Caro, for which he was immediately arrested, as the ring proved itself belonging to the Countess. But business is business, the ring should be returned. If you ask about the poor local ring, then for 10 coins they will direct you to speak with Hildaroy Motril in the castle. And also tell you about the existence of a secret passage leading to the room of the Countess. You can talk about the ring and Hilardoy, but you can ask about the ring and at the very Alessia Caro, but in order for them to answer, you need to raise their location up to 70 or higher. Then we learn that the Countess always wears his ring, except when she goes to bed. Then she takes off the ring and puts it in a jewelry box. We can only wait for the night and broke the lock, sneak into the rooms of the Countess. Here are just a lone guard patrolling the corridor, which is better not to catch the eye. But he goes on the same route, so sneak past him special problems will not be. Passing the guard, we find the door leading into the bedroom of the countess, and break open it. In the room next to the bed is the very jewelery box, which stores the ring. Pick up and go out of the castle, still trying not to catch the eye is patrolled by guards. Go back to Ahdarzhi and give her a ring. She will tell you that it uses the ring to read letters and other documents castle, then pay posited amount for the return of the ring. Now we have to go back to S'Krivve and report that the job completed successfully. For this she will raise us up by robbers. If you open the prison grating, behind which sits Amuso, he escaped, but the lockpick will still require. In order to raise fees for ring Countess Caro, you need to go back to Ahdarzhi and tell that Amuso sold it to the Countess. Need to sell stolen goods buyers-worth 300 Septims to get this job. S'Krivva report that during our absence Hieronymus Lex pulled guards from around the Imperial City Waterfront in in order to catch the Gray Fox. He did not lift the blockade of the area until someone will give him the Gray Fox. Must be made to relieve the siege of Lex Waterfront. To do this, in turn, need to go to the Imperial City, Metredel find and get her further instructions. To find out where the hidden Metredel, questioned beggars. If the location you have not less than 70, they will tell you where she was hiding, away for free. Otherwise will have to part with 15 seventh. So, from the poor learn that Metredel hiding in the house Dunari Amnisos on Talos Plaza. Find Metredel, which already has a plan to lift the siege of Waterfront. Once Lex pulled guard from all over the Imperial City, it's time to start "rampant crime" and five persons, one of whom - you. Need to steal a significant thing. 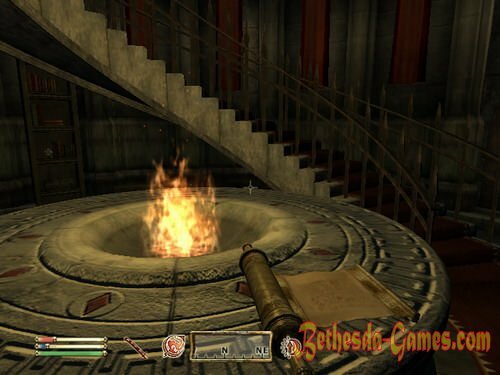 You got a job to steal the famous artifact - Ice Staff Hrormira, which is in the chambers of Archmage, the University of the Sacraments. Metredel also give a note from the Gray Fox, you want to leave the table archmage. On the matter is best to go at night when sleeping archmage. Special problems with the extraction of the staff will not be important not seen by other local magicians. So, pick up the stick, leave a note and return to Metredel. When staff Metredel surrender, she says that one can only wait for the aristocrats and wizards do not start to fuss. She will say that you need to go to the Waterfront and watch Lex. Go there and find Lex, and then can only stand and watch. 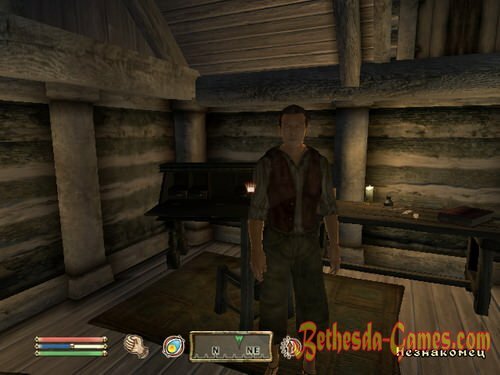 After some time, will Dremora who have come to Lex give him a note and then disappear. Worried Lex starts immediately withdraw his men from the Waterfront. Note that transmits Dremora, Lex dropped. Thus, it remains only to return to Metredel and report that the job is done. But she has one final task: it is necessary to return the ice staff Hrormira. However, to return it directly to the university's too dangerous, so Metredel offers enclose it in a chest in the house Ontusa Vanina, which is located in the Talos Plaza. Scold him at night and puts a stick in his chest. It's done, you can go back to S'Krivve. For the fulfillment of this mission you will raise to "burglar". Need to sell stolen goods to buyers-up $ 400 Septims to get this job. S'Krivva wants to know what happened to a thief named Teranis. He was sent to steal the book "The Lost History of Tamriel", which is necessary to the Gray Fox. For quite a long time from Teranisa nothing was heard. Go to Skingrad and find beggars. If their location to you is greater than 70, then they are willing to share information away for free. If not, will have to pay 20 coins. The beggar says that Teranis was arrested, he had been drinking at the inn "Two Sisters" and boasted that he stole something precious from the castle. By law, meanness, Captain Dion was in the tavern at the same time. He was arrested and dragged Teranisa him in prison. Have to go to jail. But the guards to let visitors and flatly refuse to bribe them does not work. Therefore, in order to get into the prison, you need to try another way. It is possible to commit a crime and give yourself to drag in jail, but it is not the best way. It is better to lurk near the door and wait a moment when you do not notice the guards, and then try to pick the lock. The easiest way to do it under cover of invisibility. The third option - it is to get a job in the castle. After asking people become aware that the butler Noise Gros Yarug looking for workers. If you find him, he was offered a job - to feed the prisoners. Soon, get inside the dungeon, you will find there only a single prisoner - Lartzhara Ulovnya. He says that his cellmate Teranisa-Argonian stole Pale Lady. Some, whom she leads, returned, some - not. But after the third time will not be refunded one. Teranisa taken away three times. On the floor were great drops of blood on them and have to go in search of the missing prisoners. Soon you will come to this and Pale Lady - vampire that vytsezhivaet inmate blood and bottled. We'll have to kill her, because she is determined not very friendly. Teranis already dead and books when it is not. But alive his cellmate, Argonian, and along with our old friend - Amuso. After talking to him, we learn that before his death, said Teranis Argonian where hidden book, but Amuso not say anything as long as we do not help him escape from the palace. Help to escape the conclusion - a crime, so the eye of the guards is better not to get caught. When you leave the palace and reach almost to the gates of the city, Amuso thank for saving and say, where is the book: it is hidden under a bush behind the house Nerastarela that around the well. Amuso himself decides to commit suicide arbitrary thief and try again to join the Thieves' Guild. Find a book where said Amuso and include its S'Krivve. It will be grateful, though upset news that Teranis dead. For the work she will reward 400 gold. It often happens that a couple of the guards on duty on the bridge, near the gate of the palace, and when he saw you with Amuzeem immediately throws. You can sneak under the invisibility, but you can try fastrevelitsya a nearby area, and then from there to reach the place, leading from the palace to the city Skingrad where Amuso and thank you for salvation. Need to sell stolen goods buyers-up $ 500 Septims to get this job. S'Krivva say that Gray Fox tired of the hassles delivered Hieronymus Lex. It is time to get rid of the annoying captain once and for all. It was learned that the Countess of Anvil Millon Umbranoks looking for a new Guard Captain, this is a request from the Imperial Guard list of recommended persons. Need to steal this list and fake it to Lex was the best candidate. Go to Anvil, where we find the local beggars. Inquiring about Dairihill account, we learn that in the castle are many secret places, and you need to see a blacksmith. The castle contains a blacksmith named Orrin. It will show a secret passage leading to the office Dairihiil, past the guards. It is known that Dairihiil supper together with the Countess, with eight in the evening until midnight, so it's best to go look for a letter in this period of time - it will not be in place and will be easy to steal a letter with recommendations. Now we need to forge this letter so that Lex was the best candidate. Questioned beggars on the street and either Anvil zabesplatno or 15 gold, we learn that in Anvil lives master forger, known as the Stranger. Who he really is - nobody knows. His place of residence - an abandoned house, behind the building of the Mages Guild. In the morning it does not happen to catch it will have to wait until the afternoon or evening. Stranger deliver a letter, and he agrees to fake it for 500 gold coins. However, have to wait 24 hours. After a day return for a fake. Now only remains to put it is not an imperial seal, so she went for the real paper. Go to the Imperial City and the night climb to the barracks of the Imperial Guard. But that's about the desk is constantly on duty captain of the guard, and penetration into the office - is punishable. It is better to go through the dining room in the barracks, and then get into the office through the door that connects it to the dining room. So it will be less likely to be detected, due to the fact that the captain will find ourselves behind. Imperceptibly take print, lying on the table, and the letter is ready. Now you need to play the role of courier and personally take the letter to the Countess Umbranoks. Handed her a letter when she receives visitors in the throne room. After reading it, she decides to take Lex for the post of captain of the temple and give us the answer to be delivered Hieronymus Lex. Again, go to the Imperial City, we find Lex and handed him the letter. Lex shocked, after so many years Gray Fox won a victory over him. But orders are orders, Hieronymus Lex goes to the Anvil. Waterfront free. Go to S'Krivve and say that it's done. We get 1000 gold and a new rank - Prince of Shadows. Need to sell stolen goods buyers-a $ 600 Septims to get this job. In S'Krivvy no longer work for you. But she says that he is interested Gray Fox you. We can only wait. Soon you will visit Metredel and give a message from the Gray Fox: an urgent need to meet with him in the house Helviusa Sisii in Broome. Go there and stay there for most of the Gray Fox. He will say that he needs a certain subject, which is hidden in a secluded monastery of the Holy Silkworm. This subject - Stone Saville. Gray Fox takes a bloody price, if you have to kill someone in custody, but can not kill the innocent. You can talk to the beggars on the subject, then, to learn that the priests Silkworm live in the Imperial Palace, and their work is connected with Scrolls of the Ancients. Reading them, they become blind, and soon they are sent to an underground temple where they live the last days. Despite the fact that the priests Silkworm blind, they are masters of the battle in the dark, so it's best not to let them know of your presence. So, when you reach the temple, we must find the entrance to the underground catacombs. Suggest a road can Holger brother, but that he has helped you, will have to raise its location to 70. However, living in the catacombs of the monks will not be looking forward to your presence. If you do not want to fight, try to quietly sneak in between. The monks are blind, so for an experienced thief sobogo not working go unnoticed. Making his way through the dungeons, coming soon to a large corridor, where a monk stone guards and protective Ayleid stone that hits the cold magic at a distance, if you are in a zone of influence. You can hide behind a monk and provoke fire at him, and during the "recharge" sneak Saville. Quarried stone and get out of the dungeon. Go back to the Grey Fox and get a reward of 500 coins. Gray Fox will say that with the help of this stone he can see through the palace guard. in the dungeon can be found a note "Instructions: Grey Hood," which describes a very specific properties of the Grey Cowl Noktyurnal. After reading, you can ask about the Fox hood, and he will say that it is true. He cursed and Fox nobody knows you and he had met only a name you do not remember it too. Need to sell stolen goods buyers-up $ 700 Septims to get this job. Again, you have to wait when you visit the informant from the Gray Fox. Soon he finds you, he is your old friend Amuso, who kept his word and entered the Thieves' Guild. Now he works messenger. Gray Fox is waiting for you in the house Malintusa Anktrusa that Chorrol. Gray Fox says that he needs Boom release. She recently found a court magician Fatis Aren from Bravo. Go to Bravo and ask beggars (fee of 20 gold, if you do not like them), where Fatis arena. Learn that aren Fatis usurped the tower to the south-east of the city, where he keeps his most precious things. Passage in the tower closed, but certainly should be a secret path leading into it. Go to the Castle Bravo and make our way into the room unnoticed Fatisa Arena. Ransacked it properly, we do not find any arrows. But when viewed from the wall is a lever that opens a secret passage to the dungeon. Dungeons are filled with rats gryazekrabami, magicians and various Daedra. Once you get beyond the caves, you will soon come out of the cave, flooded with water. To go further, it is necessary to dive into the water, where you will find the passage. Soon you will leave in vneyshy tier tower Fatisa Arena. However, most Fatisa there may not be. Finished with his guards, climb to the top, where you will find a chest arrow points release. Taking it back to the Grey Fox. He will give you a cash prize and awarded the title of Master Thief. Fatis aren yavlyaetsya member of the Mages Guild, so if you are also a member of this guild, kill it should not be. Need to sell buyers-stolen goods worth 800 Septims to get this job. Soon will come to you and give Amuso that Gray Fox wants to meet in the house Ganredhel in Cheydinale. Gray Fox wants to know where he is buried the famous thief - Footed Jack. According to rumors, he was buried in the magical boots that are necessary and Fox. Descendant footed Jack - Dzhakben, Earl Imbelsky, lives somewhere in the Imperial City. 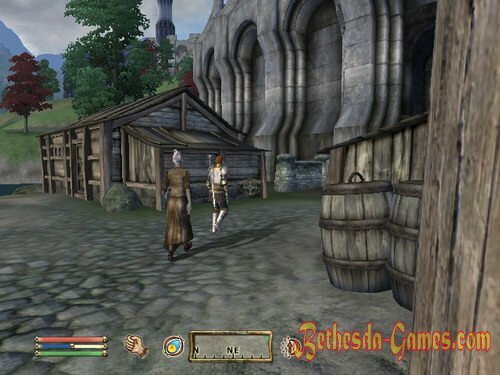 After questioning the beggars on the streets of the Imperial City, we learn (10 coins if you do not like it) that Dzhakbena have a house in the area Talos Plaza. Also learn that he is constantly closed in itself and is largely nocturnal. It is best to come to him in the afternoon. Dzhakben be intimidated by your presence and tell you that the entrance to the family vault in the basement. He will give the key to him in exchange for something that you saved his life. Go to the crypt and find there ... vampires. Apparently, it is their lair. Kill them or sneak past. Soon you will stumble on the coffin-footed by Jack, that does not boot, but there's diary. From the diary we learn that quick on Jack died. He became a vampire, and now his name - Dzhakben, Earl Imbelsky. Go back and kill the reptile. Remove his boots and carry them to the Gray Fox. Gray Fox will be pleased and say that this is the last piece of the puzzle. Now he needs a bit of work with the Stone Saville, before he calls us to the next job. The last task. Dzhakben can track you into the crypt, where tries to attack. Or did he disappear to return later with the best equipment. If you read the blog Jack, we learn that he was familiar with the Grey Fox. If you talk to Fox on the subject, he will say that he is not the first Gray Fox. The first thief died after being stolen Noktyurnal hood. Another master-thief who took the hood, took its shape and a curse, and it lasted for 300 years. Need to sell stolen goods to the buyers-up $ 1,000 Septims to get this job. Soon you will find Amuso and say that Gray Fox is waiting in the house Otrelosa, which is located in the Elven Gardens of the Imperial City. Gray Fox will say that it's time for the final, grand theft, he was planning for 11 years. If it succeeds, it will talk about for many decades. Need to steal one of the Scrolls of the Ancients, which is stored in the Imperial Palace. The front door is locked, but with the help of Stone Saville Grey Fox found a secret entrance - this is the old way, which has already been forgotten. However, to open the gate, you must activate the "Vessel of Time", located in the basement of the Imperial Palace. In the palace will be waiting for Celia Camoran who wanted to read a certain scroll. However, it will have to stay a little bit ... and you - to take its place. To perform this task need Bystronom Boots Jack and Boom release, which returns us to the fox. For this assignment Gray Fox dismisses Bloody Prices for any slain, the main thing - to get the scroll at all costs. Go to the Imperial Palace, where unnoticed by guards break open the basement door and make our way inside. Inside the guard on duty one must not fall into his eyes, hiding in the shadows. In the basement there is a giant hourglass - this is the "Vessel of Time". Activate it, get out of the palace. Is the entrance to the sewers was talking about Gray Fox, and unlocks his key, which we were given. Now we are in the sewers. Following it and destroy enemies (or sneaking past), soon to leave the old ways that is under the Imperial Palace. It is known that the White Gold Tower was built Ayleids, so the old way is abandoned Ayleid dungeons, which is full of different kinds of undead. Have to wade through all the old way, and eventually you will come to the Great Hall of the Ages. Going further north, you'll see a large statue and two small. You are on the very spot where the release is to be used Strela, but first you need to open the lock in this column. Go south on the upper tier. There we turn and go east. Notice place where there are two red crystal (they do not shoot) - this is the place where you have to shoot, but it is fenced with iron bars Ayleid. Going further to the east, where the transition to the next room. There it is necessary to find and press a special unit that will lower Ayleid lattice in red crystals. After this is done, go back and notice that not only omitted lattice, and stone columns, giving the freedom of the undead, hide behind them. Straightened with them and get up on the tile, which is in the middle of the crystals. Then a large statue of turn, and it will open a keyhole. Need without leaving the tiles, to open the lock, and the need for this release of Bolt. But you have to stock one shot, so save before firing. First best practice with the usual arrows. 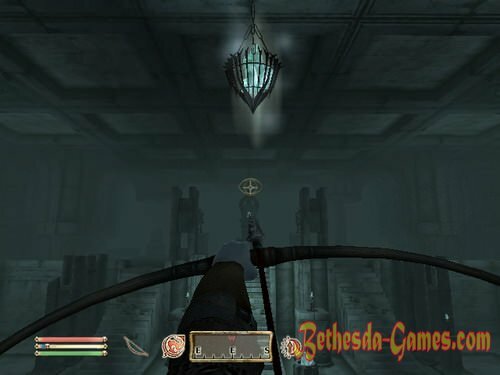 Getting into the castle accompanied by snaps, so as soon as you hear it, change the arrows on the Arrow release and shoots again. After hitting the statue rises, revealing the entrance, but there will be other surprise. Two small statues come to life. They will not statues, and golems - Ayleid guards. Destroy them or sneak past. Login lead us to the Imperial Palace in dormitories. Quiet out of them and get into the corridor, where the palace guards quietly collects the scattered papers, no one noticing. Go to the library, which holds the Scrolls of the Ancients and sit down on a chair, prepared for Celia Camoran. The main thing is you can not talk to priests, otherwise they will know that you are not Celia Camoran, and the quest will fail! When we bring the scroll, pick it up and notice that the door was closed behind us - no way back. Need to go to the second floor, and crept through the priests, to continue the way, hoping to find an escape route. Soon you will be taken to the room Imperial Battlemage Ocato. You need to go into his office and find a fireplace, and through which to get out of the Imperial Palace. Jump down the chimney, though will fall from a great height: in this case and were given Boots Bystronom Jack. Flying a considerable height and landing, you will remain intact, and the boots will scatter pieces. So you're at the beginning of the Old Ways - now only have to get out into the fresh air and take the Ancient Scroll Grey Fox. Gray Fox shocked! Scroll finally his. He will take it from you, but ask to make one last favor: he will give you a ring that must be attributed to the Countess of Anvil Umbranoks Millon. Take the ring and go to Anvil, to the Countess. Give her a ring. She was very surprised, whence it with us? This ring once belonged to her husband, disappeared 11 years ago, that's just the Countess does not remember his name or his face, nor who he was. Here comes the stranger (the same buyout forged lists of candidates), puts on a mask and Gray Fox with strong magic scroll Ancients rewrites history, throwing off the curse on the true thief hood - Emmer Darelota. When he takes off his mask, Countess recognized him at once - Corvus Umbranoks, the missing husband. Since then, as 11 years ago, he donned the hood Noktyurnal, curse has done its job - his name and his history is erased from the world, since no one knew him and did not recognize even his own wife. He became known as a stranger. Curse was so strong that I had to rewrite history with the help of the Scrolls of the Ancients, to destroy him. Corvus breaks all his ties with the Thieves Guild and hands Hood Noktyurnal you. When you wear it, you take of the Gray Fox, but without it you now remains himself. Umbranoks himself meanwhile quietly Anvil will rule together with his wife. History rewritten, with the curse lifted the hood and on the site of the ruins of the house now stands Darelota building Thieves Guild. If you are a member of the Guild robbed or attacked him, you will have to pay a penalty to restore the membership. If you kill a member of a guild, or someone else on the job, you will have to pay a "bloody price" 1000 Septims to restore its membership.